Your pup will look as sweet as a holiday cookie when wearing this limited-edition Gingerbread Dog Harness Vest by Doggie Design. What is more adorable than a holiday gingerbread cookie? A pup wearing an outfit with a holiday gingerbread cookie on it! 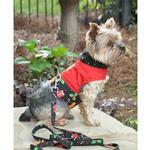 This limited-edition holiday fashion dog harness by Doggie Design is perfect for holiday photos and outings! Make the holidays bright with this comfortable confection that makes all of your outings more festive. 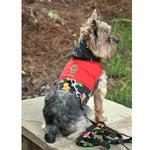 This fabric vest features coordinating holiday fabrics, a gingerbread applique, and a matching leash. You and your pup will be ready to go on any shopping trip or stroll in an instant with the easy-to-apply touch fastener at the neck and chest. Did Fido feast on too many holiday goodies? No worries, because the heavy duty hook and loop tape provides a wide range of adjustment. Look for the matching Gingerbread Dog Harness Dress (sold separately) for an adorable holiday outing duo! Get them while they last! Just like fresh cookies out of the oven, everyone will be grabbing these up while they're hot! Gingerbread Harness Vest with Matching Leash by Doggie Design Customer Photos - Send us your photo! We just adopted Finn this month. He walked into the house as if he had been here forever! Posted On 12/20/18 by cynthia h from Terre haute, IN Yes, cynthia h recommends this product! This holiday vest is colorful and bright. 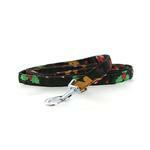 Very well made & matching leash! Posted On 11/17/18 by cynthia h from terre haute, IN Yes, cynthia h recommends this product! This harness is perfect. I bought two for my male Cavalier King Charles Spaniels to match the dress my female will wear. The embroidery is beautiful. The matching leash is a bonus! This is a very easy process. Thanks a bunch!